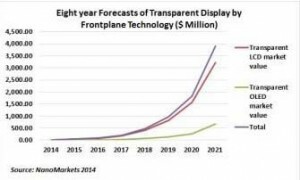 Industry analyst firm NanoMarkets has published a new report on the emerging transparent displays market, predicting that its revenue will grow to US$974 million by 2019. The report, “Markets and Opportunities for Transparent Displays: 2014 to 2021”, stated that the rise of wearable computing and the success of augmented reality apps in mobile devices will prove to be strong market drivers for transparent displays. Transparent displays are also attracting attention from tier one electronics firms such as Apple, AUO, Google, Japan Display, LG, Nokia, and Samsung, while raising the profile of firms such as Planar that have offered professional and retail displays for years. Most “transparent” cell phones today are actually semi-transparent and in sometimes the transparent display is the actually the keyboard not the main display. There are now several startups planning to launch more sophisticated products, but the future of mobile transparent displays is in the hands of industry giants Fujitsu and Samsung, according to NanoMarkets. If these firms follow through on their plans, the mobile transparent display market will reach US$787 million by 2019. These revenues will be further enhanced by transparent displays for wearables, where Samsung and Google have recently formed an alliance to supply OLED displays for Google Glass. The signage and retail market has used transparent displays for some time, but the report estimated that it will reach around US$110 million by 2020 fueled by new applications for transparent displays such as transparent billboards, smart vending and transparent retail displays. While OLEDs are being pushed as a key technology solution for transparent displays the technology has its own issues. It has yet to really catch on the display industry as a whole and is not yet able to be used outdoors. NanoMarkets noted that some firms have apparently been able to create commercially viable transparent display products based on LCDs that just use ambient light. These firms include Samsung, Eyevis, and Japan Display.